The Hampshire Hotel is located in the best part of the centre of Amsterdam, next to the Rembrandt Square. This 4-star hotel offers modern accommodation and is easily accessible by public transport with only 10 minutes the tram will take you to the Central Station. 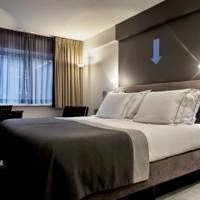 Hampshire Hotel - Rembrandt Square Amsterdam offers spacious rooms with a modern look including flat-screen TVs and other amenities such as box spring beds. Free WiFi is available in the rooms. Amsterdam’s number one nightlife area with its trendy bars and clubs is only a couple of minutes away. Equally, the Rijksmuseum and Van Gogh Museum are within easy walking distance. Bike rental is also possible at the front desk, which is open 24 hours a day to help guests find their way around the city. The French brasserie FLO Amsterdam serves lunch (Monday till Friday) and dinner in a typical Parisian atmosphere. It has a Fruits-de-Mer section with a selection of fresh oysters, lobster and crab. Drinks are available at the trendy hotel bar, Bar 36 Black. The hotel also offers an extensive breakfast buffet in the morning, including various breads, croissants and a variety of spreads and fruits. Amsterdam Tourist Information. Travel theme. Powered by Blogger.